Does a Ph.D. Help in Baccarat? Dr. Young K. Lim, Ph.D., wrote an e-book entitled The Baccarat Code, published by MillionEbooks.com. According to his ads, his method is the result of “thinking outside of the box,” which does not require a large bankroll or taking big risks, and which has never suffered any major losses for Dr. Lim. It originally retailed for $2,800 for the first 50 buyers when it was released in 2004, after which the price went up to $3,800. Dr. Lim has also created and taught many methods for playing roulette, and in fact, his baccarat method is an application of the “Difference Method” in roulette. Dr. Lim’s baccarat method involves grouping Player and Banker decisions into doublets. There are four possible doublets: PP, PB, BP, and BB. (Similarly, in eirescott’s Birthday Paradox Grail, Player and Banker decisions are grouped into triplets, ref. Can Betting on Birthdays Make You Rich?.) The frequencies of each doublet are tallied as they occur while playing a shoe. Based on his experience, Dr. Lim has found that the most common doublet in a shoe will be more likely to reoccur. So, his strategy involves repeatedly betting the most common doublet. For example, if the PP doublet is the most common in the shoe, then keep betting that PP will show up again. 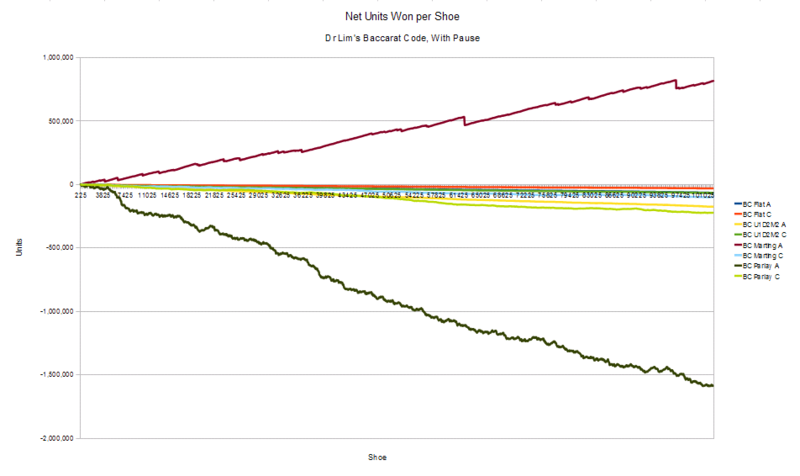 Thus, Dr. Lim’s method is a trending method, which assumes the existing bias in the shoe will persist. By considering decisions in doublets, Dr. Lim believes he has made a revolutionary breakthrough in the development of baccarat strategies. A significant portion of Dr. Lim’s book is devoted to bet progressions. He discusses the pros and cons of a variety of bet progressions, such as flat betting, Martingale, Labouchere, D’Alembert, Fibonacci, and Parlay. Because his bet placement method is based upon the recurrence of doublets, Dr. Lim believes the 2-step Parlay is very well suited for his system. I performed baccarat simulations of Dr. Lim’s method using flat betting, U1D2M2 (a modified D’Alembert), Martingale, and 2-step Parlay (ref. Series 16 Results). In one set of simulations (“With Pause”), I followed Dr. Lim’s procedure regarding pausing if the first bet in a doublet loses. For example, when betting PP and the first P lost because a B occurred, then do not bet for the second P in the doublet, since it is not possible for the PP doublet to occur anyway. In another set of simulations (“No Pause”), I bet continuously, not pausing if the first bet in a doublet loses. By the law of averages, it should not matter whether one pauses or not, since considering decisions as doublets does not change the fundamental odds for each decision. As in all of my prior simulations, I also examined the effects of money management procedures. To be consistent, I used the same money management procedure tested in prior simulations (ref. Money Matters). As before, flat betting and U1D2M2 employed an initial stop loss of -20u. However, for Martingale and Parlay, the initial stop loss was increased to -300u to -500u, which corresponds to about 9 to 10 levels in the progressions, to accommodate their more risky nature. My results show that when using flat betting, D’Alembert, or Parlay, that is, everything except Martingale, with or without pausing, with or without money management, Dr. Lim’s method does no better than single side betting (ref. Series 1 Discussion) and does not overcome the house’s edge. Despite the doublet nature of Dr. Kim’s bet placement procedure, a 2-step Parlay shows no significant advantages over any other type of bet progression. With money management, all betting progressions including Martingale yield Player’s Advantages no better than single side betting. When using Martingale without money management, the results are a bit more interesting. 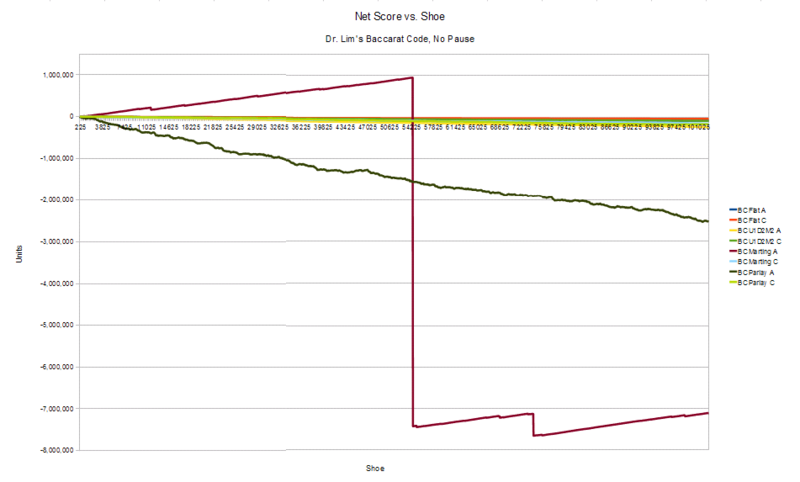 When played with pausing, Dr. Lim’s method shows a +2.28% Player’s Advantage over 102,600 shoes. However, to enjoy this win, one needs to be able to survive a -524,282u drawdown, which is the 20th level of the Martingale progression. This is simply impractical, since it far exceeds the bankroll of virtually all players, and it definitely exceeds all casino table limits. When the same simulation using Martingale was performed without pausing, a single, unrecoverable, catastrophic loss at shoe #54,327 of -8,388,578u (24th level in the progression) eliminated all prior gains and then some. This simulation ended with a very negative Player’s Advantage of -11.24%, a loss far greater than the mathematical expectancy for the game, the cost of a runaway progression. This indicates that pausing played a significant role in the simulation which had yielded the +2.28% Player’s Advantage. Pausing effectively reduces the number of decisions played, and thus helps to delay a catastrophic loss. True, it took over 54,000 shoes for the crash to occur in the simulation without pausing, but the important point is that it occurred at all. In live play, catastrophe can strike any time. Thanks to Murphy, if it can happen, it will. In the simulations where money management routines limit the Martingale progression to a more practical (yet still quite steep) 9 levels, the resulting Player’s Advantages become comparable to any other betting progression or baccarat method tested to date. Thus, the excessive risks of the Martingale progression is not warranted when playing Dr. Kim’s method. Nevertheless, it is interesting that in principle, given limitless resources and no table limits, the simple Martingale can be demonstrated to win against the house edge over a significant number of shoes. Overall, my simulation results suggest Dr. Kim’s method offers no true positive player’s edge, and in the long run will not perform any better than simple single sided betting. Does a Ph.D. help in baccarat? Unfortunately, not this time. This entry was posted on November 4, 2010 at 2:08 pm and is filed under Life with tags analysis, baccarat, Baccarat Code, baccarat simulations, baccarat simulator, banker, bet, bet progression, data, D’Alembert, eirescott, eirescott's grail, Fibonacci, flat betting, Labouchere, Martingale, method, millionebooks.com, money, money management, parlay, pause, pausing, player, results, Scott, shoe, strategy, system, testing, trigger, U1D2M2, Wizard of Odds, Young K. Lim, Zumma, Zumma 1000, Zumma 600. You can follow any responses to this entry through the RSS 2.0 feed. You can leave a response, or trackback from your own site. […] Results from Baccarat Simulations Series 16 are presented below. In this series, I examined The Baccarat Code by Young K. Lim, Ph.D.